Curry and thyme. Two classic ingredients in Nigerian cooking - especially where jollof rice is concerned. I've simply used your regular store-bought dried thyme and powdered curry (the 'Lion' brand, which most Nigerians will be familiar with) to spice up one of my favourite go-to snacks. 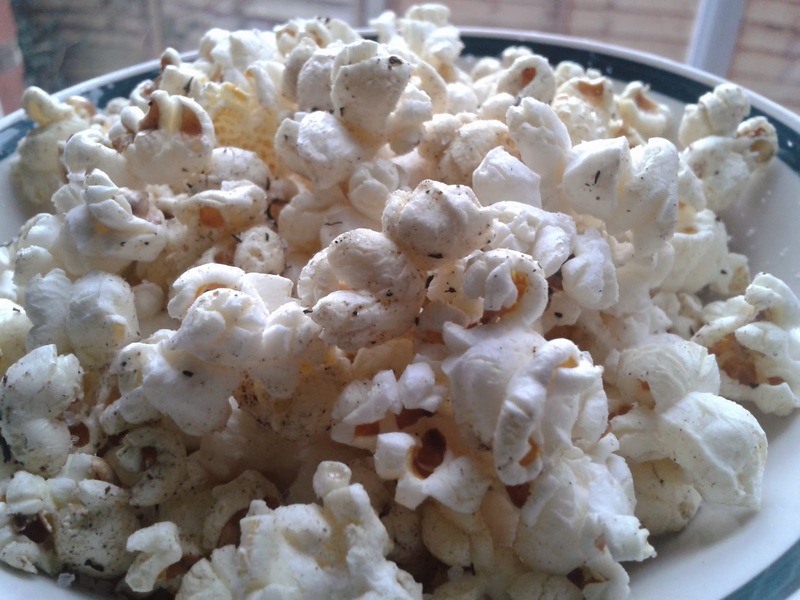 Making popcorn from scratch is not always a walk in the park. The first few times I tried it, I ended up with burnt bits and miserable looking kernels that seemed reluctant to pop. I've since discovered a few handy techniques for making the perfect batch every time. Place a saucepan over a low heat and add the oil, thyme and curry. Before the oil starts to heat up, add the popcorn kernels. Place the saucepan lid on top, slightly ajar to allow some steam to escape, but not so much that the popped kernels can jump out of the pan. You'll need to hang around and keep an eye on things. As soon as the corn starts to pop, lift the saucepan off the heat slightly and give it a little shake to prevent any from burning or sticking to the bottom. Do this at intervals until the popping stops completely. Serve with a little sea salt sprinkled over the top. Yum!